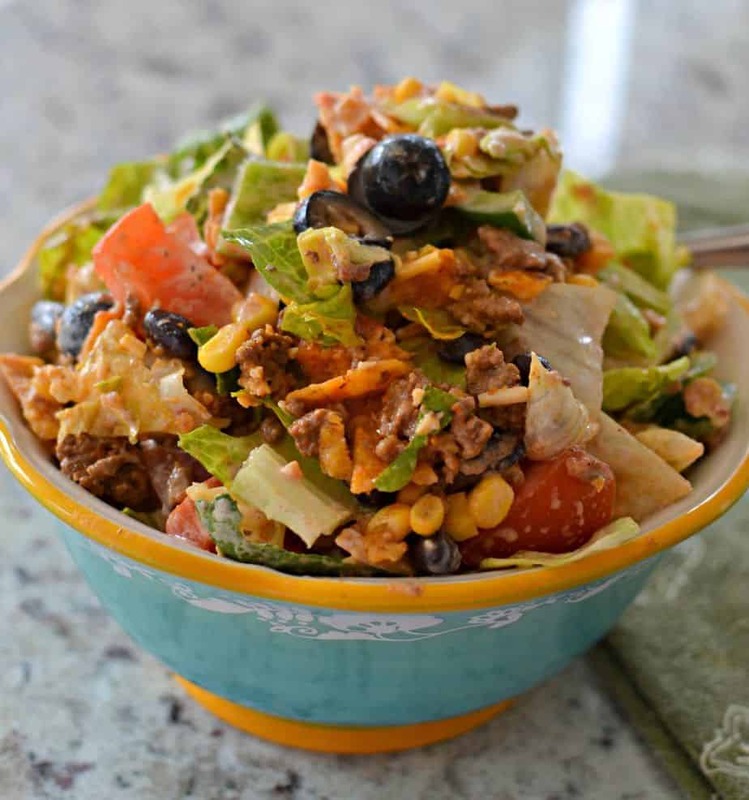 Doritos Taco Salad is a delectable combination of romaine, tomatoes, green peppers, black beans, corn, black olives, seasoned ground beef and crunchy Doritos in a slightly spicy ranch dressing. Spring has finally arrived and with it come lots of amazing salads. This Doritos Taco salad is no exception to that rule. This beautiful salad is a family favorite. It comes together quickly and can be changed up so easily! Maybe you would rather sub fresh sliced avocados for the green peppers. Perhaps you don’t like black olives and you would rather have red onions. The dressing comes together fast taking full advantage of your favorite bottled ranch. I like to purchase the Simply Dressed Ranch Dressing from Marzetti. It does not contain preservatives, trans fat, high fructose corn syrup, added MSG, or artificial flavors. This is not an endorsement for it. I just really like it!! I then add a few things to add a little zip and zest bringing this salad to it’s finest. A couple of quick pointers on this salad! Let the taco seasoned beef cool a bit before adding it. You don’t want it to wilt your lettuce! Don’t add the dressing or the chips until you are ready to toss and serve! For an added twist blacken your corn! 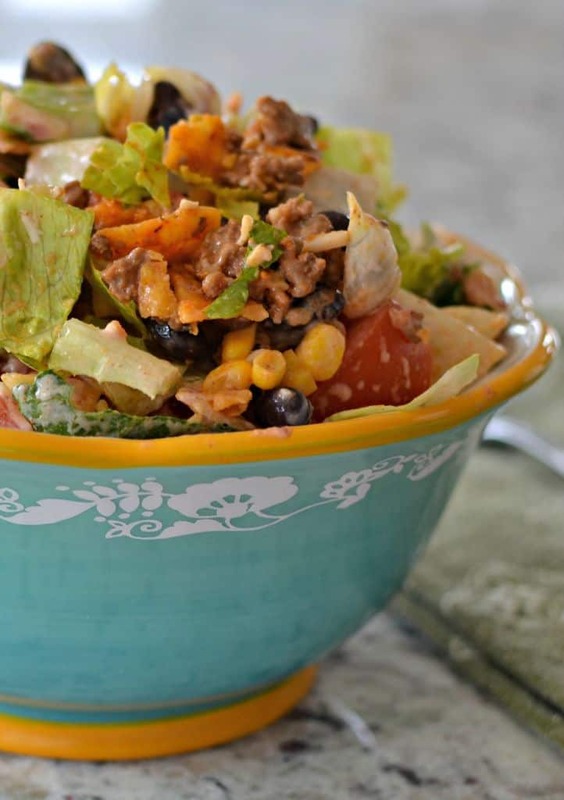 Are you a big salad aficionado? There is nothing wrong with that. We all need our greens and veggies and quite often a good salad trumps a great potato casserole. These fantastic salads are all family, friend and reader favorites. There is a little something for lots of different tastes. As my late Mother used to say wouldn’t it be a boring world if we all liked the same thing! 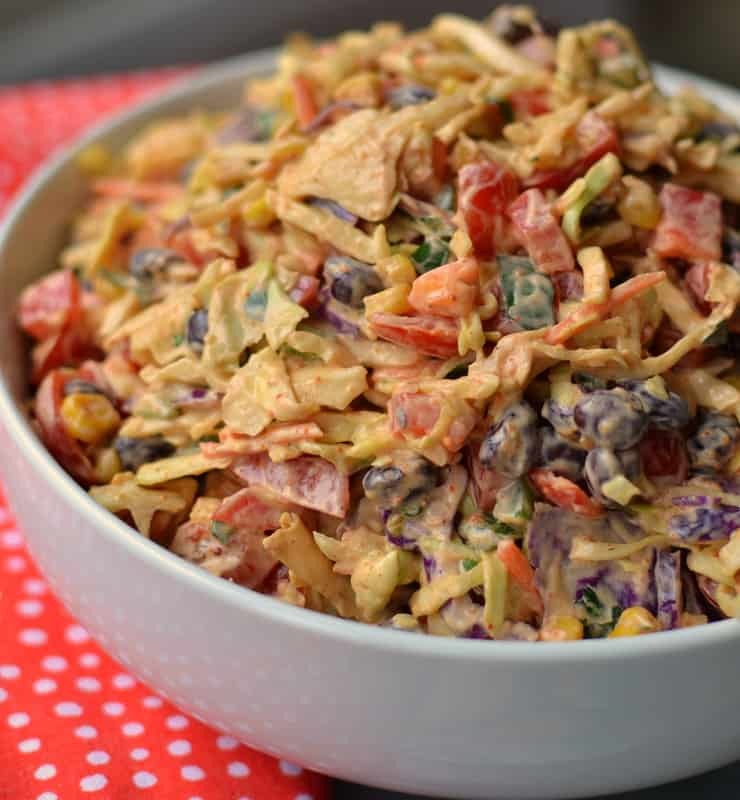 So if you are having a hankering for a downright awesome salad than this Doritos Taco Salad is right up your alley. It comes together quickly, looks beautiful and tastes oh so good. Your loved ones will be singing your praises and you feel good about the nutritious food your feeding them. 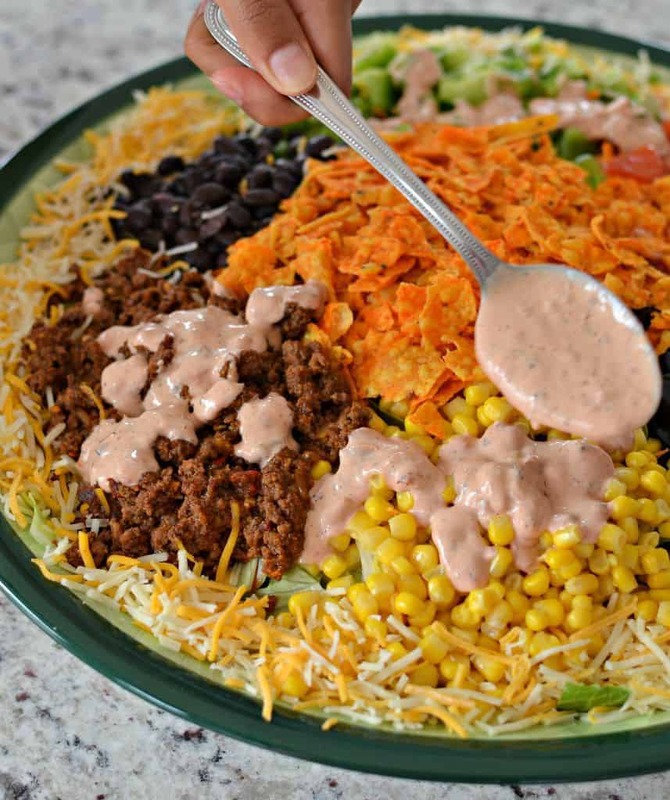 In small bowl whisk together ranch dressing, salsa, mayonnaise and adobo sauce. Cover and refrigerate. In large skillet brown ground beef, drain excess grease. Add taco seasoning and water. Simmer for 5-7 minutes. In large serving bowl add iceberg lettuce. 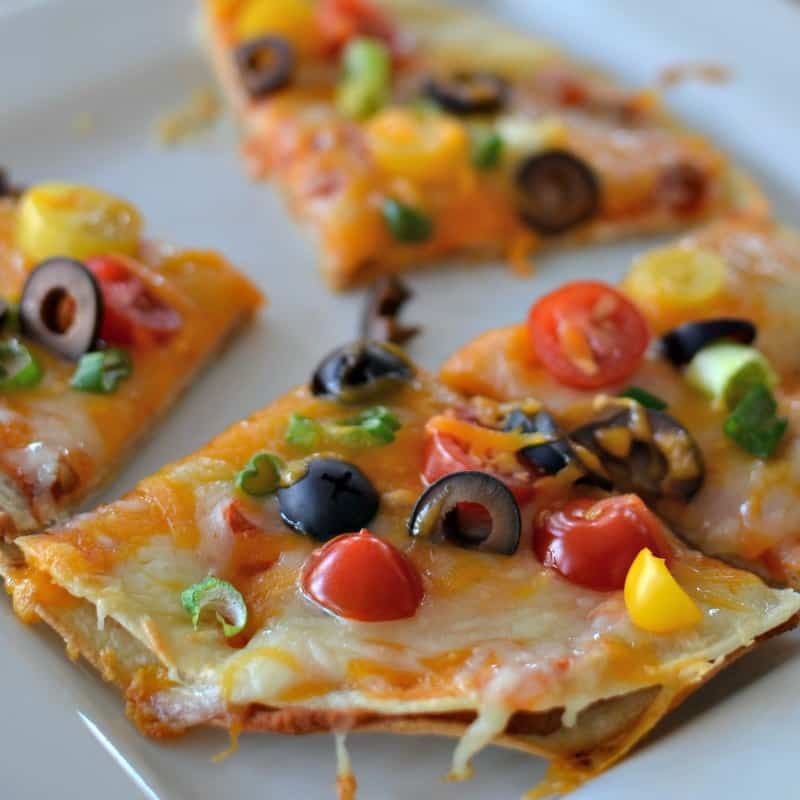 Top with green pepper, black olives, tomato, corn, black beans and cheddar jack cheese. Right before serving add crushed Doritos and dressing. Toss to coat. I get my adobo sauce from a can of chipotle peppers packed in adobo sauce. I save the leftover peppers and sauce for other recipes. They should be stored in an airtight container in the refrigerator. They can be found in the hispanic food section of your grocery. You can substitute 1-2 pinches of cayenne for the adobo sauce. Other Tex Mex recipes you will love!! What’s the serving size and how many people does this recipe feed. I want to see how Weight Watchers friendly it is. The recipe serves eight. It has been a while since I have served this and I did not measure out each individual serving. Sorry!